My parents have a cat door stopper at their home and I've always wanted one too. 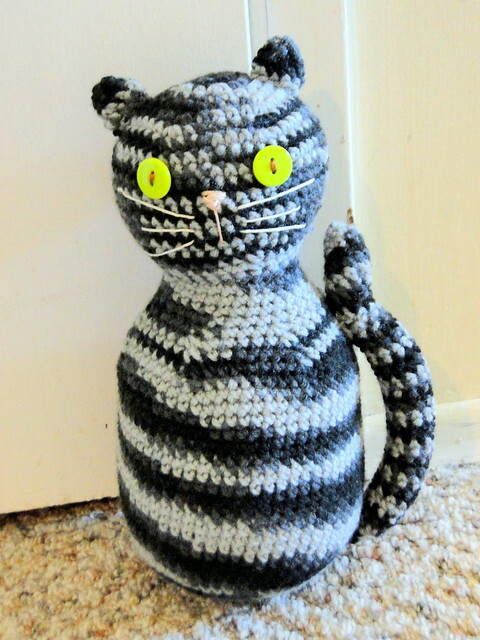 I found this pattern forever ago and just never got around to actually making it until I saw one done that looked like a tabby cat, I knew it had to get done finally. I bought Vanna's Choice yarn in charcoal print and got to work. I'm thrilled with how it turned out, it looks just like a tabby cat! 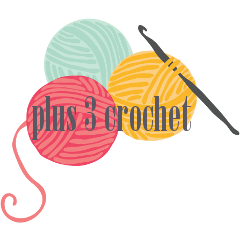 I wasn't so thrilled with the yarn, it really hurt my hands when I was working with it. I was told to try washing it afterwards but never actually got to doing it, I couldn't wait to finish this. I probably won't bother with Vanna's anymore though (after I finish grannies & ripples anyway) it's so hard to find soft yarn from her, a lot of it makes me cringe when I touch it! To make the cat actually work as a door stopper, I sewed together felt circles and filled them with rice. After the rice bag when in, I finished stuffing with polyfil and then embroidered on a face. I wasn't sure whether the eyes were going to work but I think they turned out looking great in the end. This cat is living in my oldest's room, I may make another cat someday but I really want to make this house into a door stopper first. Hi Annemarie! I have never seen a cat door stopper, that's really cute and adorable! Maybe I could crochet a dog for the same purpose! Thank you for sharing, and if you even need one to look after your cat and feed it, I'll be there ;-) have a happy week! Aww, what a cutie pie! Okay, that is really cute! I love the colors and you're right - it does look like a Tabby! That is too cute - i'm a cat lady at heart so this is certainly going on my to make list! Generate free bitcoins over at DailyFreeBits. 100 to 1,000 satoshis per 60 minutes.